GREAT LOCATION. A MUST SEE. Nice driveway, private entrance and front yard leading into a well maintained and updated Norma Triangle Bungalow style home. 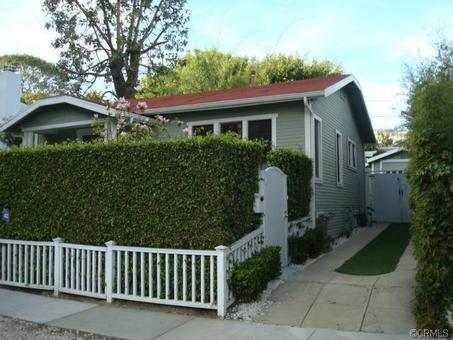 This charming 2 bedroom 1 bath home has 828 sq ft but feels much bigger. Newly updated kitchen with carerra marble counters, sub zero frig, open breakfast bar with arched openings. A very open feeling from kitchen to dining to living room. Perfect for entertaining. Nice pantry space. This home has a lot of windows and is light and bright. Hardwood floors. Did I mention the french doors that lead to a private and romantic back patio with patio cover and astro turf grass areas, great for those summer bbq&apos;s. The back yard also boasts a separate structure with a bath, approx 220 sq ft that is perfect for an office or ?. It also has a single car garage with washer and dryer hookups. This home is walking distance to Sunset and Santa Monica Blvd, close to shops and restaurants and is a rare find in this very desireable neighborhood. Don&apos;t miss this one.